The big bang model explains the history of the universe, but scientists are looking to an unseen force called dark energy to explain the universe's accelerating expansion. To find dark energy's cosmic fingerprints, scientists simulated the entire expansion of the universe on the Curie supercomputer. Dark energy accounts for the accelerating expansion of the universe. First ever full cosmological history simulated on Curie supercomputer. Simulation weighed competing models to find imprints of dark energy. To answer the world’s oldest question, researchers at the Dark Energy Universe Simulation: Full Universe Runs (DEUS-FUR) project did something new. Using the Curie supercomputer they were the first to simulate the unfolding of the entire universe to see how dark energy might lie hidden in plain sight. Explaining the evolution of our universe is a timeless task. One hundred years ago, the theory of general relativity launched a scientific method to model the cosmos. From this revolution in thought came the notion of the big bang — a singularity of infinite density that expanded about 14 billion years ago, creating the known universe in its wake. With the discovery of an accelerating universe, the big bang model has grown complicated; dark energy is one of the prevailing models to account for the speeding expansion. But simulating the unfolding of the whole universe is a tremendous computational feat, taxing even the most powerful computers. DEUS scientists ran full universe models on 4,752 nodes and 300 TB of memory on Curie, one of Europe’s first petascale supercomputers. To highlight the numerical challenge behind the simulations, the team updated their findings last month in the International Journal of High Performance Computing Applications. 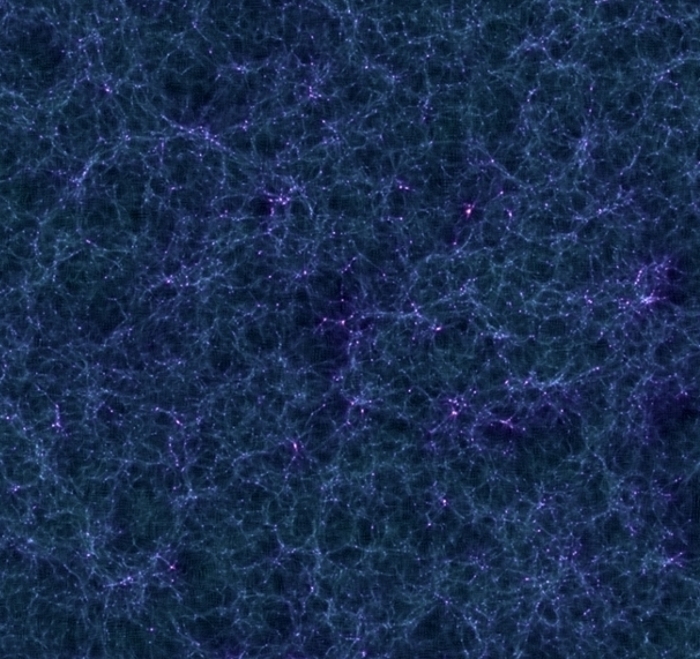 “In our domain, high-performance computing is our only way to build universes, let them evolve to explore theoretical hypotheses, connect them to observations, and understand how observed phenomena emerge from fundamental laws,” says Vincent Reverdy, numerical cosmologist in the Department of Astronomy at the University of Illinois at Urbana-Champaign and co-author of the DEUS-FUR study. To reveal the hidden imprint of dark energy and chart the historical development of cosmic structures (clusters and superclusters of galaxies), the DEUS project contrasted three competing dark energy models, each suggesting a different history of structure formation. By simulating the path of photons through star clusters, the DEUS group learned that even slight deviations between models can change the way observers perceive the universe — not to mention the results they obtain while measuring cosmological distances. The simulations are a first in numerical cosmology, but the technical effort to achieve them points to applicability for compilers, geo-localization software, and artiﬁcial intelligence, Reverdy says. As satisfying as the applications might be, for Reverdy, the real prize is found in discovery. Curie. 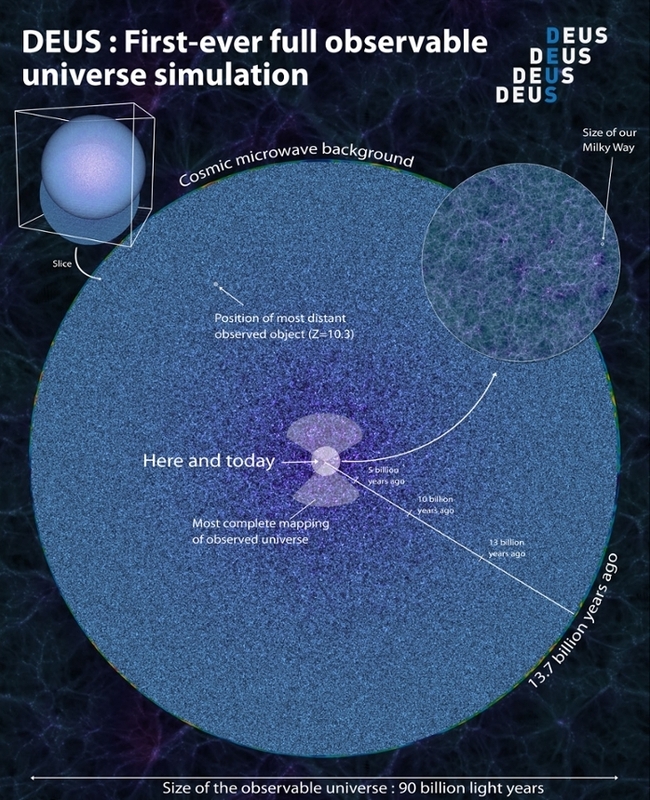 When added to others run by the DEUS group, scientists now have simulations scaling from less than 1/100 the size of the Milky Way up to the entirety of the observable universe — the first simulation to achieve this size. To do the job, DEUS looked to Curie, one of Europe’s first petascale supercomputers. Courtesy DEUS-FUR; V Reverdy.